The plan hopes to activate the space around the Van Ness Metro station (screenshot from plan). If recommendations from a new action plan come to fruition, Van Ness would swap its extra wide sidewalk space for greenery, a stormwater management system, local artwork and more retail and dining options. The D.C. Office of Planning released the 36-page “ Van Ness Commercial District Action Plan” on Nov. 12 in an effort to guide the neighborhood toward a more sustainable and family-friendly future. The plan includes over 30 goals for the area, a handful of which could go into effect as soon as next year, with others following over the next five to ten years. “The Van Ness Commercial District has the potential to improve its retail offerings and public space while showcasing world class sustainability measures by leveraging its substantial daytime population, accessibility, and the well-established surrounding neighborhoods,” the plan states. 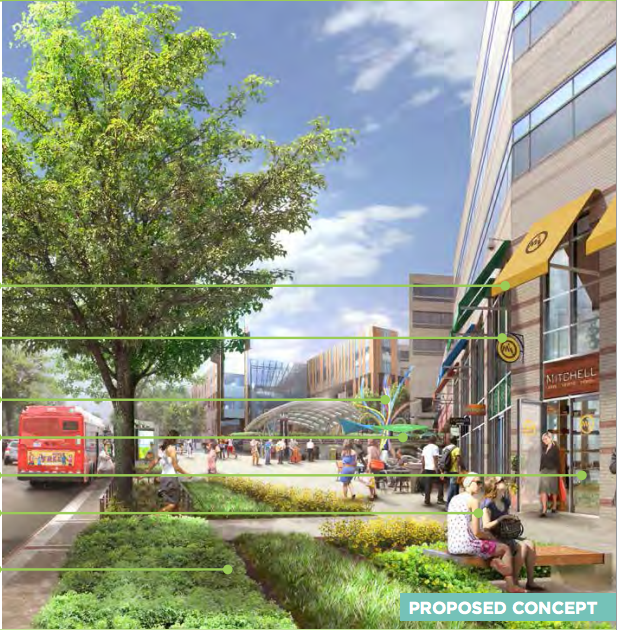 The proposal is highly focused on creating a cohesive streetscape for the area by improving landscaping and creating gathering places along the largely empty Connecticut Avenue sidewalks. 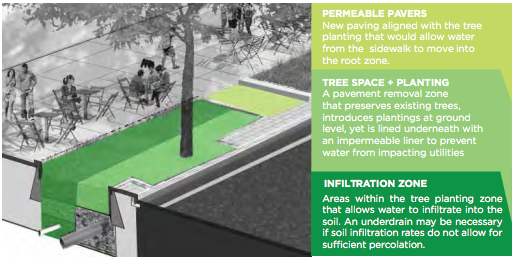 Expanded treeboxes serve as an added buffer between pedestrians and traffic and, along with permeable pavement, create a stormwater management system which catches rainwater before it runs off. Proposed streetscape improvements (screenshot from plan). At the same time, the plan hopes to bring a diversity of retailers to the neighborhood, including clothing shops and casual dining locations that are suitable for both families and students. The University of the District of Columbia is already adding to the area, with the construction of a new student center that the report says will be an attractive space for the entire community, as well as the redevelopment of the school’s law building. Meanwhile, the Park Van Ness Building, at 4455 Connecticut Ave., will deliver 273 apartment units and 9,000 square feet of ground-floor retail when completed in 2016. Some of the plan’s short-term goals include new artwork along Connecticut Avenue, high-efficiency LED streetlamps and a public recycling program, all implemented over the next two to five years. Green Infrastructure plans (screenshot from report). The plan emphasizes Van Ness’ role as a commercial center along Metro’s Red Line with potential to attract visitors from all over the District. 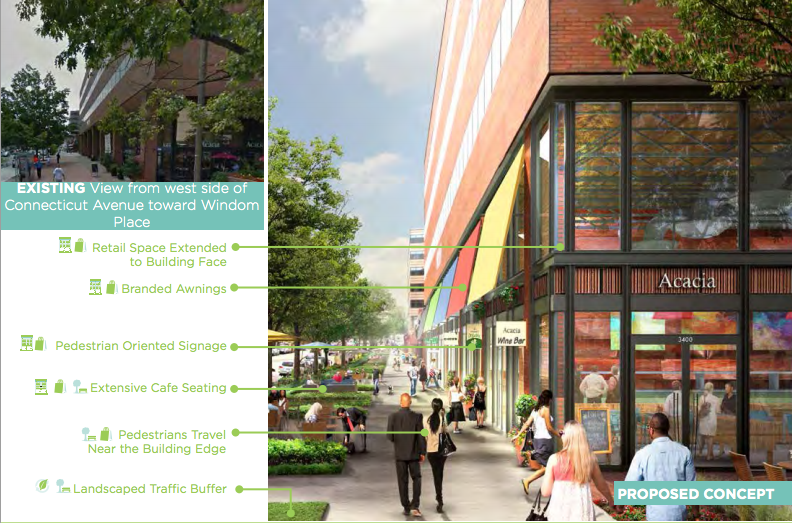 “A repositioned Commercial District will redefine the community as an energetic, lush place that attracts new customers and allows residents, students, and workers to come together,” the plan says.